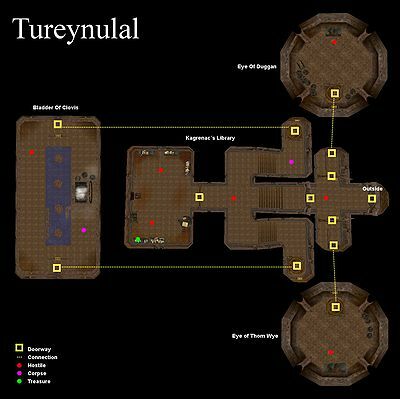 Tureynulal is an Ash Vampire Citadel in the Red Mountain region, inside of the Ghostfence. 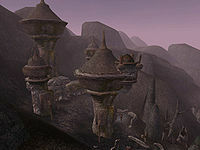 The old Dwemer fort, located just over a mountain northeast of Dagoth Ur and marked on your world map. This is where you're sent for the Assault on the Crater Citadels and in a Temple quest to find the Cleaver of St. Felms. It is divided into four areas: Bladder of Clovis, Eye of Duggan, Eye of Thom Wye, and Kagrenac's Library. Accessible from Kagrenac's Library, this area contains Dagoth Fandril and the corpse of Mendel Eves. Mendel has some glass armor (right pauldron and greaves), and the Cleaver of St. Felms. This area is accessible from Kagrenac's Library. Dagoth Fals can be found here, who possesses a key. Also here are some ingredients, and the book 36 Lessons of Vivec, Sermon 10. The Eye of Thom Wye can be accessed from Kagrenac's Library. Dagoth Galmis is here, and has a key to a closet that has a Dwemer Left Pauldron, pair of boots, Right Bracer, and warhammer in it. A potion can be found here as well.